Two directors resulted in two stories masquerading as one. ‘Tis not a typo. If a functioning story resembles a single human mind trying to solve a problem then the duplicitous and haphazard nature of Pixar’s Brave suggests a split-personality. A psychotic mess of storytelling, this film of two minds exemplifies the need for a better understanding of story structure. Pixar Animation Studios wrote the book on story during the turn of the century. Toy Story, Finding Nemo, Monster’s Inc., and The Incredibles set the bar for intelligent and well-structured storytelling. Strange then that their thirteenth film, Brave should grab a C+ on the critic compilation site Rotten Tomatoes. Logic dictates that success build upon success ad infinitum. Their film the year before, Toy Story 3, scored 99%.1 Brave racked up a paltry 78%. What went wrong? Writer director Brenda Chapman originally conceived the project in 2008 (then called The Bear and the Bow). When the film went into production she became Pixar’s first female director. This lasted until 2010 when she was replaced by Mark Andrews over creative disagreements. This split in vision, regardless of Chapman’s eventual acceptance of the film, fractured the story’s narrative and melded two incomplete stories together. Merida did turn out to simply be a boy in woman’s clothing (as speculated in the 2011 article Female Main Characters who Think Like Female Main Characters) and the film faltered on three key aspects of story structure: the Story Driver, the Story Limit, and the Main Character’s Resolve. Addressing these issues might have saved the film from the under-80 club. For stories to argue their points effectively they need to establish impetus up front. Decisions will call for actions which will call for more action and so on. Once the Author sets the argument in motion with either an action or a decision, he or she must honor that structural point of reference. If a decision or deliberation ignited the fuel of a story’s problem then a corresponding decision or deliberation will eliminate it. Same if the spark had been lit by an action—a corresponding action would smother the flames of conflict. Actions can’t solve decision making problems and choices can’t solve problems of action. Audiences expect the second half of the action/decision decision/action equation to be found as a result of the first. Without it they can’t determine the causality of the argument. Brave is driven by both actions and decisions, depending on which story you’re looking at. In the first story, the parent’s decision to invite suitors and the suitor’s acceptance of the invitation forces Merida to compete for her own hand. Had her parents and suitors decided otherwise, Merida would never have raised her bow and torn her dress. This story ends when Merida’s mother Elenor capitulates and motions for Merida to break with tradition. That decision brings to an end the argument over individual determination vs. predestined tradition. The second story sits smack dab in the middle of the first and quite coincidentally, consists of a Plot Witch (or more appropriately a Plotwhich). Beginning with mother’s ingestion of the poisoned cake and ending with the sun rising on the second day, this alternate narrative finds itself driven by actions. Mother transforms and questions arise. Do I tell Dad? Merida might ask. Or do I keep it a secret and ask the Witch for my money back? What do I decide to do? Contrast this with the first story and its parental decree of betrothal. What can I do to fight back? In either case, the narrative breaks. The two stories don’t form separate arguments the way one would expect when a work consists of different stories (Jerry Maguire, As Good As It Gets or Lord of the Rings). Instead what one finds is the sane argument being made in a way that contradicts itself. Do actions drive decisions or do decisions drive actions? In Brave the answer is yes. Arguments need boundaries. They need borders to help define their scope and refine their aim. In story these markers appear as a finite number of options or a finite amount of time. Are we witnessing the pressure to solve a problem when time is running out or when options are taken from us? Again, in Brave the answer is yes. In the first story you have a finite number of suitors: the clans MacGuffin, Macintosh and Dingwall. Add Merida to the mix and you have four little Indians to work through before mom and dad (really mom) has to make the final decision. But before any of that can play out, Merida makes her deal with the devil and the countdown begins. Now, instead of being concerned with dwindling options we find ourselves racing against the clock. Is it about the promise of betrohal or the witch’s curse? Again, yes. The story feels like it ends when mom circumvents the original Optionlock and allows Merida to do what she wants, but it doesn’t. In fact, it goes on for another 20 minutes as we patiently wait for something to happen before the sun rises on the second day. What exactly we don’t know, because that all-important decision leap-frogged the original scope of the story. Regardless of the previous missteps-forgivable with the proper storytelling—the greatest offense to narrative occurs with that very same decision. 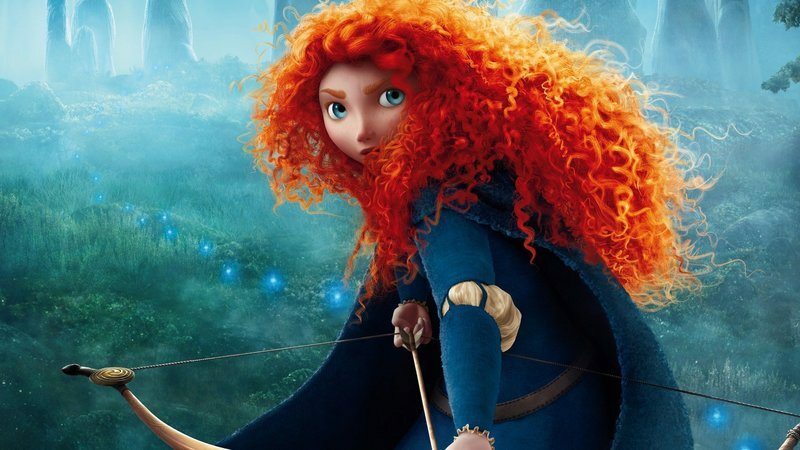 Merida, inspired by her mother’s unique situation as a bear in a castle that hates bears, steps out in front of the clans and takes control of the chaos. Confessing her act of selfish defiance Merida proclaims her willingness to give up the bow and choose a suitor. At the very same time—and in a surprisngly touching emotional moment—Elinor also changes her point-of-view, insisting that Merida be allowed to choose in her own time. You can’t have both principal characters change their point-of-view within the same context. The original argument found individual determination pitted against tradition. To have both switch sides doesn’t resolve the conflict, it only swaps the players. The Main Character and Influence Character of a story represent unique points-of-view on the same thing. This is why you frequently come across the cliched line of dialogue, “You and I are both alike.” The conflict exists between these two characters because they’re both looking at the same thing. One side has their approach, the other has theirs. Take the arument between black and white. Really, there isn’t an argument because black and white represent two different contexts. No conflict. Instead, the more appropriate argument would be to pit black and white against shades of gray. Now we’re looking at the same thing from two different points-of-view. Some see black and white, some see gray. Conflict ensues. To then have both sides switch and somehow argue for a compromise between them doesn’t work. You can’t argue black and white and gray because there are elements of black and white within gray. It’s either one or the other. Surely compromise solves problems. But in order to tell that story, one character would have to maintain an all-or-nothing perspective while the other would call for greater synergy. The former would eventually change and the story would end in triumph, proving that compromise solves problems. Selfishness is one context. Compromise another. The context in which both Merida and her mother come into conflict surrounds the idea of doing what you want vs. following tradition. They both changed on this issue, ultimately proving nothing. Even more disastrous—they made this emotional change-of-heart before the Final Act. Acts exist not to divide a story up into convenient sections. but rather to grant a subjective character the necessary growth needed to come to a place where resolve can change. Finding solutions to problems requires characters to examine all the different contexts. Leaving one out blinds the character to a possible resolution and cheats the audience out of a well-rounded argument. Acts exist to provide these different contexts, different areas where they can try out a solution. Both Merida and Elinor change before they have a chance to look into that final context, that final Act. This False Moment is why the film feels like it ends early and why we have no idea what we’re waiting for as the sun rises. Why—after having this major emotional breakthrough in the banquet hall—would Merida continue to sew that blanket? (while riding horseback of all things). She already mended the bond torn by pride. Having her continue to sew would be like Luke saying “I’m not such a bad fighter pilot myself” AFTER turning off his targeting computer! Watching Brave allows one the opportunity to experience the sensations of a mental breakdown. With two minds to choose from, separate contexts within which to measure change, fluid borders to throw our sense of time and space off, and a complete lack of logical and emotional progression, the events of Brave depict a state of mind in psychosis. Losing contact with the reality of proper narrative loses contact with the Audience. The result? Critical meh. As a story consultant I’m frequently challenged with, “Why can’t both characters change?” Brave offers an easy reference tool and a cautionary tale for the insanity that occurs when one breaks with the tradition of story structure.